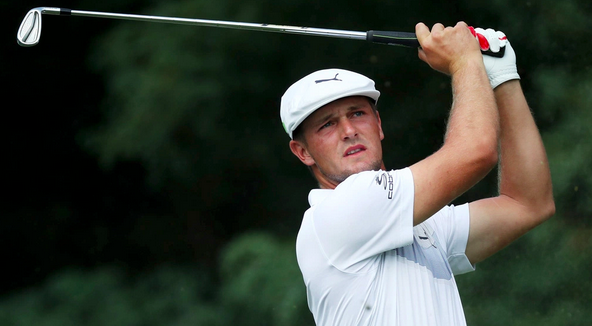 Bryson DeChambeau has riveted spectators with his unique golf swing and style. He has introduced the golf world to the Single Plane address position that we have promoted for years. 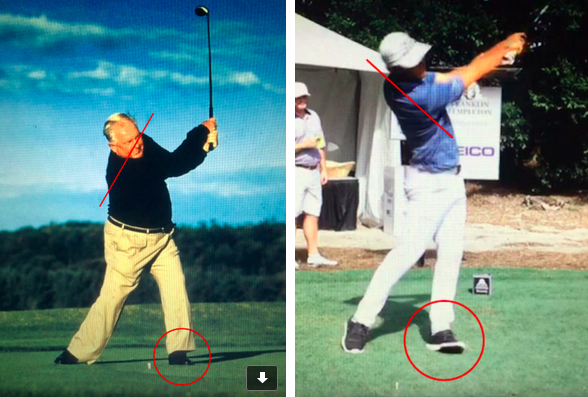 It is similar to Moe Norman in many ways but we still think Bryson’s swing can be simplified even more and Moe’s golf swing is definitely easier on the back. If you are to simplify the golf swing the following must occur. Reduce lateral movement for consistency. Reduce rotational movement and still produce speed. Reduce stress on the body parts throughout the motion. 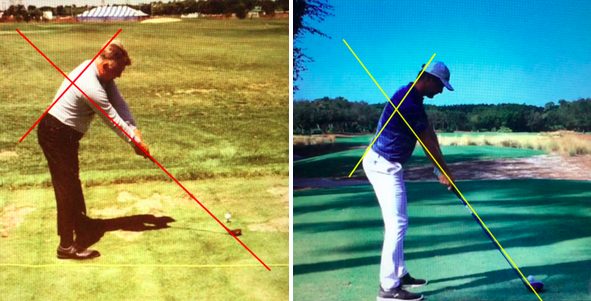 Continuing the address in the pictures below, Bryson has less secondary spine angle, side-bend, than Moe. This leads to straightening the lead leg, a lifting of the body and an over rotation of the torso through impact. One reason that Bryson has less secondary tilt at address is because his stance width is very narrow. Moe’s stance width is double the width of Bryson’s (with a driver) which helps place the spine further behind the golf ball. 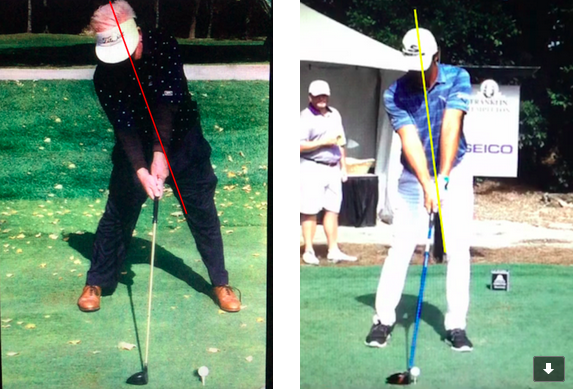 Below is Moe and Bryson at the top of their backswings. Moe on the left, has less torso rotation and maintains the side bend that he started with (this helps eliminate over-rotation). 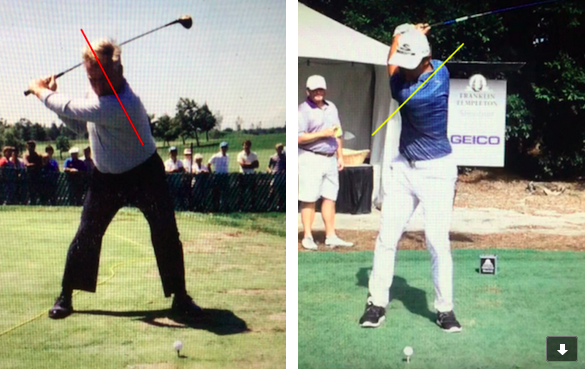 Bryson on the right, rotates his torso more than 90 degrees in the backswing. The way Bryson generates speed is by extreme rotations and long levers. Bryson is 6’1″, 24 years of age, and has a daily workout routine. The average age of a golfer in the United States is 59 years old. Not many are flexible and healthy enough to copy Bryson’s 24 year old rotational movements. Below is the release position of Moe and Bryson. Highlighted in Bryson is the torso rotation and the lead foot. Since both of Bryson’s arms are still straight, this has forced the lead shoulder to continue rotating thus eliminating speed production from the arms and wrists. The lead foot has spun out caused by a straightened lead leg forcing stress onto the lower back. With Moe, the lead foot is fully stable on the ground. The lead knee is flexed which takes the stress off of the back. The torso rotation is less as Moe’s lead arm has folded allowing the wrists to release. Biomechanically, this is the safest way to position the body and the main reason that Moe never had pain. Golf is fun if you don’t hurt. Therefore our goal is to produce maximum speed and move the body safely to reduce injury. The best and easiest way to learn this is at one of our Golf Schools or through our Gold Membership / Coaching Program.